Dishonored: Definitive Edition has been available for a little while on Xbox One and PS4. Although some significant visual upgrades can be seen, we regret that the game is not running at 60 fps, something we think is more than possible on the last two consoles from Sony and Microsoft. Check out what the game looks like with the following videos captured on PS4. 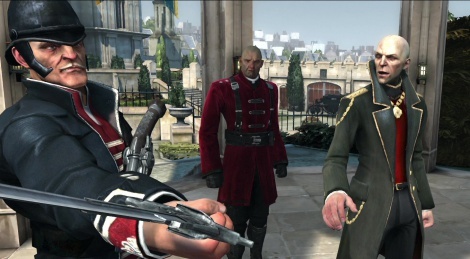 these are named "xb1 - gameplay ###"
Seriously, Dishonored is a brilliant game with catchy gameplay. Hopefully the 2nd installment will not be as much a graphical downer as the first one was. Muddy texture was not justified by the artistic approach of oil-painting-esque style as hinted by the dev, in my humble opinion. This game was never visually appealing to me so I never played it. My little brother absolutely loved it though. it's one of the best stealth games i've played personally. and i LOVED the style of it. it feels like half life 2 in a lot of ways, but looked like game artwork. plus it had the all important freedom of approach that these games kinda need plus the ability to ghost the entire game. due to it's art style though it doesn't really benefit much from an up-res imo. but if people are wanting to try the game, may as well go the PS4/Xbone version. it feels like half life 2 in a lot of ways, but looked like game artwork. I think one of the led art directors on this had worked on HL2. Loved this game...but can't justify getting it again on ps4 for slight graphical improvements when i played it years ago at 60fps on my laptop! Am looking forward to the sequel though. It's really shameful how they opting for 30fps, when a laptop can do better.